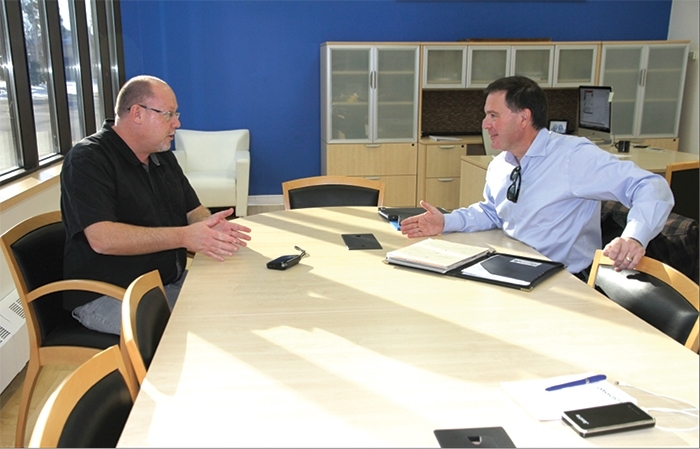 World-Spectator editor Kevin Weedmark interviews Sask Party leadership candidate Gord Wyant at the World-Spectator office. I was a lawyer in Saskatoon for 25 years at a large firm—the McKercher Firm. I spent three years on the Public School Board in Saskatoon, two years as the chair, and after that three-year stint I went on to Saskatoon City Council and served for seven years before I was elected to the Legislature in 2010. Since 2012 I have been the Minister of Justice and Attorney General. I have had responsibility in that time for Sask Builds, and Priority Saskatchewan, Policing and Corrections and Saskatchewan Power Corporation. I’ve had some Human Services Ministry experience and significant economic portfolios in my time in government. I think that experience and my law background and my business background has given me a unique set of qualifications to serve as the premier. When Brad decided he was going to step down I went home and had a nice long talk with my wife and we decided it was an opportune time for renewal in the party. Certainly the premier has given us that opportunity and I think I’ve got some unique assets to bring to the job, so that is why I decided to run. Why did you decide to run for MLA in the first place? This goes back to my school board days. I had no real plans of running for the school board and one of my friends came to me and said ‘you know, there is a vacancy on the school board, why don’t you run.’ I ran for the school board and then got elected. And it just so happened that my city council seat was vacated by the sitting city councillor in 2003, so I ran for the position. When Brad and I had a discussion in 2007 about whether I wanted to run for the legislature I said to him I am pretty happy with my law practice, I work on city council, so I didn’t run in 2007. The existing MLA in my area, Ted Merriman,had decided not to seek re-election, but I wasn’t ready for it at that point of time. But just a short couple of years later when the MLA who did get elected chose to step down before the 2011 election, there was a by election and a few people came to me and said you should think about this. So I decided to run in the by-election in 2010 and I was elected in my area, then again in 2011 and 2016. How do you go about campaigning for a job like this? Do you hit every small town in Saskatchewan? We are driving around Saskatchewan and going to as many communities as we can. I made a pledge that we were going to get to every constituency and we are getting there. Just go around and talk to people and talk about my plan for renewal, talk about how I want to help move the province forward both economically and on the social side. It is really about travelling around and talking to people and getting your message out. Of course I had to step down from cabinet so I don’t really have the cabinet responsibilities that I had prior to running in the race. It is really about getting out and meeting people and talking about your story and talking about what you could bring to the job and your vision for the province. How do you gauge support? Other than the fundraising totals, is there an accurate way to gauge support? We do some informal polling. I think all the campaigns are doing some polling. I think they are fairly small polls so I’m not sure if they really give an indication, but I think that our message is resonating with a lot of people. The more people we talk to I think the more people are coming out to events. At the beginning you get 10 or 20 people out but now we are having 40, 50, 60 people out. We have 300 people in Regina when we get back there this afternoon. That is an indication that your message is resonating with people. It is hard to know where everyone is in the race. Everybody wants to put out their own polls and extol the virtues of where they think they are in the campaign but I think we are doing pretty well. I think our message is resonating and certainly people are happy to hear what we have to say. One of the things we are going out and talking to people about is the founding principles of the party. We are talking about how and why this party was created in the first place. We are talking about the coalition, we are talking about how important it is to make sure that we maintain that coalition. Over the last year or so, especially since the last budget, I think you’ve seen some people who are not feeling as warm with the party as they once felt. This is a big tent party—liberals and conservatives and we all came together as a party. We have to remember where we came from. We have to use our founding principles to build on the great success that we have had over the last ten years and not lose sight of the foundation of the party. Over the last little while we’ve maybe lost a bit of that direction, so the message I am taking to people is we need to sit back and think about where we came from because that is the basis of our electoral success. We have to make sure that the flaps of the tent are as wide open as they can be and we need to invite people back into the party that perhaps don’t feel as warm as they once felt. We want to talk about the economy as a tool to accomplish what the people in this province want us to accomplish—good health care, good education, a good solid social safety net— and not just simply focus on the economy for the economy’s sake. The economy is the tool that we need to accomplish what the core business of government is, and that is people. We are in the people business and we need to remember that. Focusing on the economy, making sure that we balance our budgets, making sure that we’re true to our founding principles. We’re all fiscal conservatives, we all believe in balanced budgets and living within our means, but in our haste to get to that we can’t lose sight of what our core business is. We are talking about things like about how we can help grow the economy, tax incentives, tax credits for industry development, for technology development, those kinds of things. We need to try to work on programs to reduce our reliance on cyclical commodity prices so that we can level that out. We need to talk about economic development in that context because that is really our currency in terms of being able to provide the services that the people of the province expect from the government. That really is what our message is. Brad Wall has been a popular premier, especially in rural Saskatchewan, and especially in this area. What is the next leader going to have to do to fill those shoes? People talk about what big shoes there are to fill—well, a new leader has to come to this job with their own shoes and they are new shoes. Nobody can come to this job and expect to be Brad Wall 2.0. That is not going to happen. The new leader has to bring his own vision and his own direction. We have a strong rural base in Saskatchewan. We need to be careful to make sure that we protect our rural base, but also make sure that we’re not alienating our urban base. We have lost two by elections in the city of Saskatoon and that is indicative of the fact that there are people who perhaps are not as enchanted with our party as they once were. We need to find a way of not only protecting the rural economy but also at the same time making sure that we’re more attractive to our urban base because that is really where the next election is going to be fought, in the city. New Democrats have made some headway there and I worry if they make too much more headway it’s going to challenge our electoral success in 2020. I really think the next premier of this province needs to be from urban Saskatchewan but understanding how important the rural economy is to this province. Having the support of people like Lyle Stewart, the Minister of Agriculture, and the former Minister of Agriculture Bob Bjornerud is very important in terms of making sure that we bridge that gap in between rural and urban. How would your approach be different to Brad Wall’s on issues like the Carbon Tax? There are those things in this province that this government needs to continue to stand up against the federal government on. Carbon tax is one of them. I had the great privilege of being the Attorney General who is responsible for moving forward with the discussion with what our legal challenge will look like if the federal government ends up imposing that tax on the province, working hand in glove with the Minister of the Environment to build our case so that if it is imposed on us we will have a strong legal case. And I very much believe we have a strong legal case against the federal government if they choose to impose it. Continuing to stand up against the federal government on those issues which we think are not showing the province of Saskatchewan a whole lot of respect, and the carbon tax is one where we took a very strong stand with respect to the tax changes that the federal government had proposed and I think that made a difference in the position that the federal government had. We need to take a very strong stand with respect to the renegotiation of the equalization formula. I made that announcement that we need to discuss the fairness of that equalization program as a relation to the people of Saskatchewan. So to take a very strong stand against the federal government on those issues that are important to Saskatchewan, but at the same token remembering that we live in a great country and we are all proud Canadians and we want to build a country for all Canadians. There are things I think we can work with federal government on to advance the interests of the province, to make sure that we get our fair share when it comes to programming that the federal government is contemplating. I think you can disagree with someone without being disagreeable, and I think that we have been a little bit too disagreeable with the federal government on things that we don’t need to be disagreeable on. We can disagree on the things that are important to us and fight for the interests of the province, but be an equal partner when it comes to building this country. I believe in cooperative federalism. When I was the minister working on the common market regulator, we wanted to build a common securities regulatory scheme across this country—getting the provinces together to work on that is all co-operative federalism. That works to build a country. We need to continue to work with our partners in confederation and the federal government in building this country. At the same time, we have to stand up for what is right, especially when it comes to the interests of the people of this province, and the carbon tax is a great example of that. You have been travelling the province quite a bit. What sort of things are you hearing around the province? In smaller urban municipalities we are hearing about infrastructure. How can we be more innovated in helping smaller municipalities deal with their infrastructure challenges? We talked about trying to leverage more private capital to do those kinds of things, but insuring that we have the infrastructure in this province to drive our economy, because without the infrastructure we don’t do our economy a service, we don’t allow it to grow, and we don’t allow it to expand, so those kinds of things we are hearing about. We are hearing issues around mental health and addictions. It’s a big challenge, especially one that was significant within my ministry when I was the Justice Minister. We are hearing a little bit about the GTH. People are asking ‘what are you going to do about that and I think you may know that I announced very early on in my campaign that we need to have an inquiry once the RCMP are done to clear the air. There is just this cloud over the government, and we’ve always been a government that when we make a mistake we admit the mistake and we fix it. This is a good example of something that we need to get in front of and we need to put to bed so we restore the confidence of the people in our party in the extent that it has been damaged through that issue. What have you learned through this leadership race? When you are confined to a ministry in the government you have lots of information about what’s going on in your ministry, how it if affecting people, but when you actually get outside the building, when you are actually out driving around rural Saskatchewan and small urban centres and the big cities, you are hearing a lot of other issues that you might not necessarily hear about. I’ve heard a lot in the Quill Lakes area about flooding, things that normally don’t concern you quite as much as the Attorney General, but certainly there are big issues in rural Saskatchewan around flooding and water issues and those have been very educational in terms of hearing different perspectives and trying to decide how working with communities we are going to find a path forward on some of those issues. It has been great, hearing a lot of things that I might not of otherwise heard a lot about. What is your measure of success in this race? Is it a case where if you are the next premier, that’s success, and anything else is failure? Success would be winning, but the other measure of success is making sure that if you’re not successful, that some of the things that you are advocating through this campaign are implemented by the new leader of the party in the party going forward. Issues like ncreasing funding to mental health and addictions is an important issue for me. Making sure that we are funding classrooms properly, that is an important issue for me. And so win or lose, those are going to be two of the main focuses that I want to bring forward, either as the premier or as a member of the legislature. It would be great to be the next Premier, but I think another measure of success is making sure that some of the things that you’re advocating for, that are important to the people of Saskatchewan, get implemented after January 27th, so that will be my focus.